The intent of marriage was to be a covenant between a couple and God to symbolize and declare their union to the world. This cemented their exclusivity to each other and their commitment to God that they would stay together and live their lives according to His principles. Throughout the years, marriage has become less of a covenant with God and more of a contract between two people. Most people still go through the motions of a God centric ceremony, but is He really in it? Is he really still the focus? Do people truly mean what they say in the vows that they profess during the wedding? Let’s start with a few definitions. What is a contract? A contract is a written or verbal agreement between multiple people. What is a Covenant? 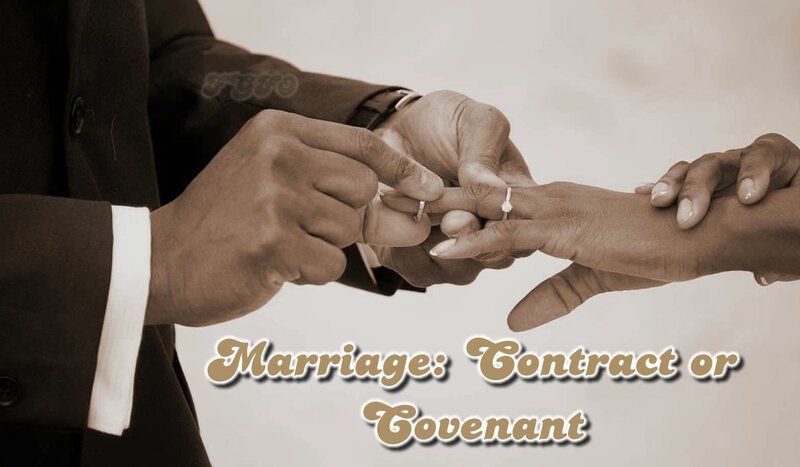 A Covenant is a contract that brings about a relationship of commitment between God and His people. I believe that the lack of understanding of these definitions, having little or no faith, and the disrespect for who God is and His power are major reasons why so many people marry the wrong person and why divorce is as high as it is here in America. If we treat marriage as only a contract then it’s merely a piece of paper determining how strong our union is. Contracts are broken all of the time and therefore makes divorce more plausible. It’s just a piece of paper, right? In essence, marriage is being treated more like a business partnership with a prenuptial agreement as the terms for dissolving the partnership when we’re no longer happy with the arrangement. A covenant is so much more than just a contract. By definition alone, it has to be greater because it involves the use of a contract to establish itself. A covenant infers something sacred and should command respect. It isn’t something to be entered into lightly, but this happens all of the time. True faith in God and His Word (The Bible) were the intended basis for marriage, but we know that’s not usually the case nowadays. And how many married couples do you know where you can honestly say that they sought God’s direction and approval of their current/past spouse before they got married? I’ll wait… So if faith in God are not apart of the marriage then there’s no way that it can be considered a covenant. It’s just a contract, right? And there’s my main point. To many people, marriage has become nothing more than a piece of paper. A piece of paper with an agreement to be together until it no longer suits one or both of them. There’s nothing stronger than themselves keeping the relationship together. There’s no consequence or higher authority to answer to or be mindful of. Well, I guess if money and assets are your god then I stand corrected, but I digress. The astronomically high divorce rate is a direct reflection of the number of marriages held together by a contract. There are still a few marriages that have been going strong for more than 30, 40 and 50+ years but they aren’t as easy to find. And that’s because they got married in a time where divorce was an option but frowned upon. A time where marriage was still a covenant between them and God; A time where God was still the founder of our country and “In God we trust” was a true statement on our currency; A time when marriage meant more than just I love you… right now; And a time where what you promised to God meant something. It's always different when you use numbers to illustrate a point so I've included an infographic, below, about the state of divorce here in America. The statistics on divorce in America are staggering and can be disheartening. Marriage can be difficult enough without feeling like the odds are stacked against you. I agree with the argument that people view it as a contract versus a covenant. Thinking of marriage as a contract suggests that we have the right to dissolve the union based upon certain “clauses” not being met or not allowing for addendums and/or amendments. So many of us go into it with a laundry list of what the marriage will be. We love each other, check. We have similar goals for the future, check. We both want 2 kids and a dog, check, and so on. Then things that didn’t make the list come up like he lost his job and I’m carrying the financial load, or she always wants to spend the holidays with her family with no regard for mine, or he always wants to hang with the boys on weekends, or we found out she can’t have kids. These are just a few examples of the kinds of things that come up, but weren’t found itemized on our list. We realize, more often than not, they are deal breakers. Contract terminated. Divorce statistic, check. On the flip side, there are those of us who view marriage as a covenant. It is not simply a contract between two people, but it is a pledge, a promise, an oath, a declaration, a vow. It’s a binding of words and actions exchanged between the betrothed, witnessed by those assembled, and sworn unto God. We as covenant makers, enter into marriage with the understanding that only death will separate us. It’s a guarantee that for us, divorce is not an option. We mean, for richer or poorer, in sickness and in health, for better or worse, not just in and for that moment, but for life. In essence, our word is our bond. If more people entered into covenant marriages, understanding that our vow to God and our spouse is an undertaking that will take a lifetime to fulfill, more couples wouldn’t rush in unwisely and unadvisedly, and the divorce rate would decrease. Don’t get me wrong, I’m not saying that people in abusive relationships should stay together. I want couples to enjoy safe and fulfilling relationships. Use wisdom people. Just know, you don’t get to the happily ever after without sweat equity and plenty of elbow grease. My father used to say anything worth having is worth working for. Marriage is work. It is not for the faint of heart or the ones who change with the direction of the wind. If your word is your bond, if you’re in it to win it for the long haul, then you are convenant material. Contracts need not apply. And that's my 2¢. Hey, if you have comments or do not agree with this article let us know. Leave your comments below. And don't forget to share this with someone else who you think may be interested in this topic but remember that it is For Grown Folks Only! Click the image to enlarge it . Enjoy.